CNG: Printed Auction CNG 75. ATTICA, Athens. Mid 4th-3rd centuries BC. AR Tetradrachm (16.90 g, 9h). Imitative issue. Sale: CNG 75, Lot: 292. Estimate $750. ATTICA, Athens. Mid 4th-3rd centuries BC. AR Tetradrachm (16.90 g, 9h). Imitative issue. 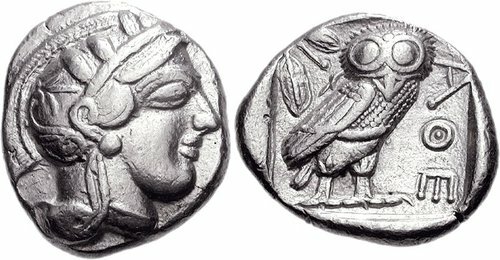 Helmeted head of Athena right / Owl standing right, head facing; olive sprig and crescent behind; all within incuse square. For prototype: cf. Kroll 8; cf. SNG Copenhagen 31. Good VF. Well centered.